Please have a look at this link to my recent CNN interview on North Korea (with David Gergen). 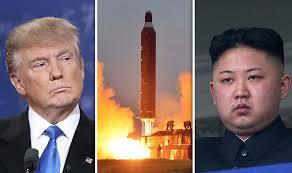 For all of President Trump’s huffing and puffing, we just came through a very tense weekend to realize the Trump North Korea policy is essentially the same as the Obama policy, but with the added danger of a volatile, unpredictable, and under-informed US president. While Trump is offering trade concessions to China in exchange for help with North Korea, China is extremely unlikely to do what it takes to halt Pyongyang’s nuclear weapons program as long as Beijing fears a reunified Korea allied with the United States more than it fears a nuclear armed and hostile North Korea. China will happily play the United States and extract concessions, but the president has jettisoned America’s leverage by killing the TPP and undermining our alliances and the master of the deal in this case is Beijing. Many observers have noted the similarities between the US and North Korean leaders — both mercurial, vain, volatile, and with haircuts not even a mother could love – but it’s now becoming clear that both are also practitioners of military theater. Who could be surprised that North Korea paraded missile canisters over the weekend even though it’s highly doubtful they were filled with actionable missiles? But when the president of the United States says he’s sending an “armada” he hasn’t actually sent, the hard-won credibility of American leadership is undermined. These past weeks have seen a dizzying number of flip flops by the president and his team on many issues (Iran, EXIM, China currency, Russia), but it’s far better for America and the world that the administration turn away from the self-defeating path of the original platform. Maybe that’s what’s called relative optimism. By most measures, the Trump administration is off to the worst hundred days of any president in recent US history. But Donald Trump is still the captain of a ship on which many of us are passengers. We can only hope that the ship stabilizes and do all we can to help make that happen. Part of this responsibility is speaking up.